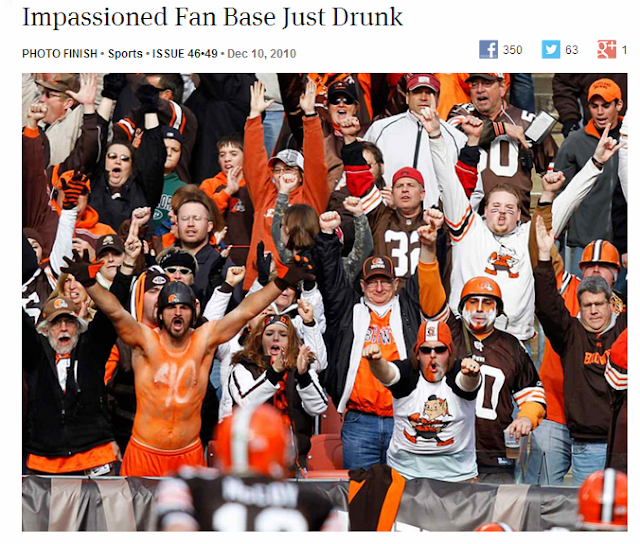 The Onion suggests Browns fans like to drink. Weird. So I am a week or two behind in my handy-dandy The Onion desk calendar. I didn't notice until today the October 17 entry, which apparently is a rerun of a 2010 image of Browns fans'. Not too shabby. "Impassioned Fan Base Just Drunk" is quite humorous, I must say. Of course they could have chosen many fan bases for this--but it takes a certain amount of alcohol to make watching a Browns game in person over the past dozen years actually bearable. By the way, this appears to be a picture from a game that you really needed a drink after. The 2010 Jets game, where the Browns came in after beating the Patriots and Saints, and lost in overtime, with :16 seconds left, on a Santonio Holmes TD. This game is remembered for the mole the Jets placed on the Browns roster, one Chansi Stuckey, once drafted by the Jets, who fumbled the ball in overtime as the Browns were driving toward field goal range.